The Crescendo™ vocabulary includes several Activity Templates. 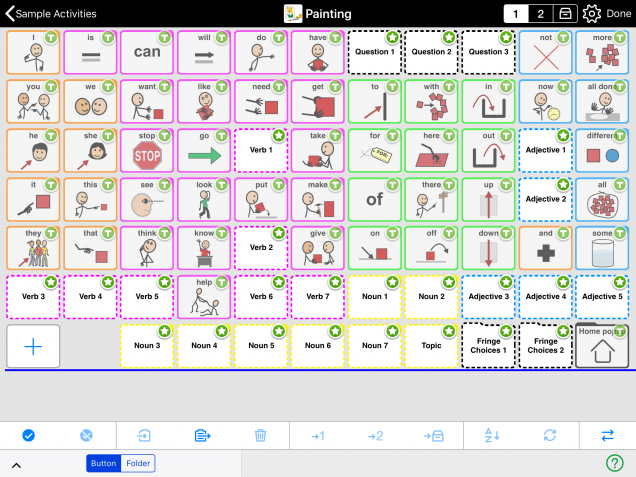 Activity-specific folders have long been a popular way to get started with AAC. These often include mostly pre-programmed phrases and nouns specific to the activity. Many students can quickly become successful communicating with this kind of folder. However, the words included might not be very helpful once the activity ends. 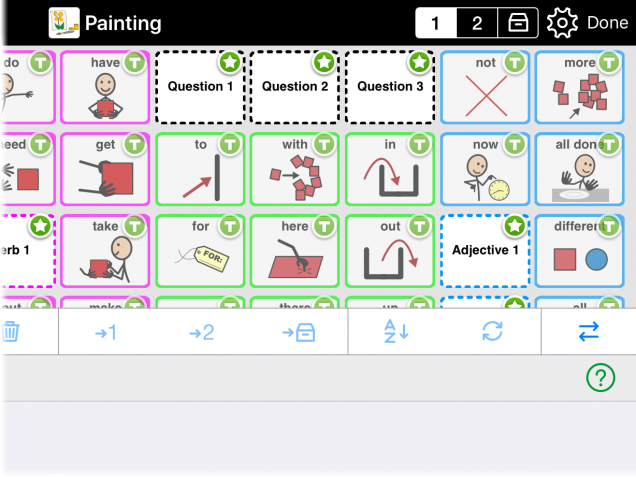 Crescendo's Activity Templates support teaching core words within particular activities. There are seven Activity Templates: Create, Daily Life, Let's Talk, Motor Play, Out & About, Reading, and Toys & Games. Each contains a set of core words most appropriate to the general category of activity. Core words appear in the same location on the screen as they do in the rest of the vocabulary. Once a student learns where a word is, he or she can generalize this knowledge to the rest of their vocabulary. The Activity Templates also include placeholder buttons for activity-specific vocabulary. We have suggested word kinds for each button to help you create a balanced selection of words, rather than just nouns. 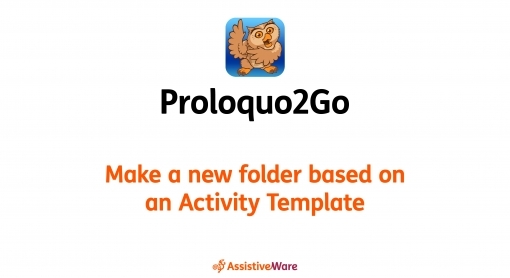 Proloquo2Go will ask you to choose a template for your folder. Scroll down to the Activity section. To choose a template, tap its name. On iPad, this will bring up a preview of how the template will look in your grid size. When you are satisfied with your template choice, tap Next> to continue. Type a name for your folder. Your folder cannot have the same name as a folder that already exists in the user’s vocabulary. Select Done to finish creating your folder. You will now need to add words to the new activity folder. In Edit Mode, double-tap the new folder button to go inside it. Many buttons in the Activity Templates are placeholder buttons. These have a dashed outline and a green star in the top right corner. You will need to add content to them. First, tap the placeholder button you want to edit. The Basics section of Edit Mode will open. Next, tap inside the top text field. Replace the text suggesting the grammatical category with the word you want the button to say. Proloquo2Go will automatically change the Label field to match your changes. Depending on your grid size, you may also have one or more placeholder folder buttons available. To replace one of these with a real folder, tap it. You will see the same options as when you create a new folder button. Choose New Folder to create a folder and fill it with vocabulary. Choose Link to Existing Folder to open a folder that already exists. Choose Duplicate Existing Folder to copy a folder that already exists and edit it without changing the original folder.